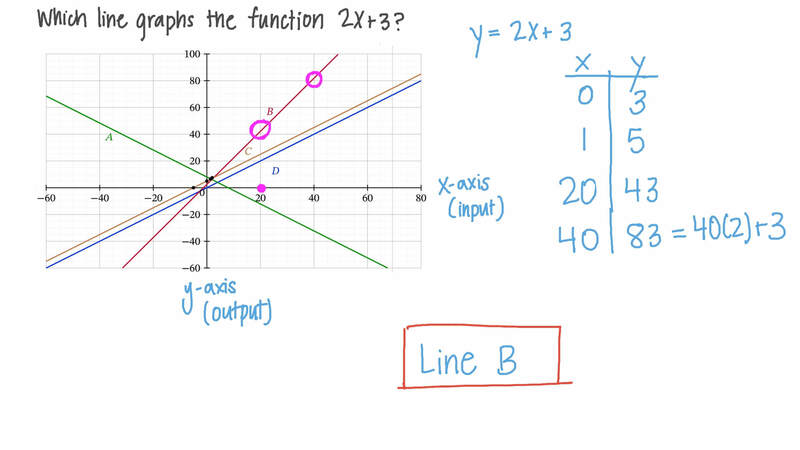 In this lesson, we will learn how to identify the graph of a linear function. Which line graphs the function 𝑦 = 2 𝑥 + 3 ? Complete the following statement: The graph of a function is . After graphing the function using the given table of values, determine whether it could be a linear function. AIt is a nonlinear function. BIt could be a linear function. Determine whether the given table of values must be from a nonlinear function, or could be from a linear function. AIt must be from a nonlinear function. BIt could be from a linear function. Does the shown figure represent a linear function? Moataz read 2 books of 150 pages each in 3 months. At his school, the teacher showed a graph of the number of pages that pupils in his year group are expected to read against time. Does Moataz read less or more than what is expected from his school? What is Moataz’s reading rate? What is the expected rate? A car manufacturer claims that the consumption of fuel of one of their cars is 5.2 L/100 km. Bassem measured the distance she covered with different volumes of fuel. She plotted her results and drew a line of best fit. Did her car consume more or less fuel than what the car manufacturer had claimed?